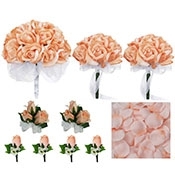 How long does it take to receive my wedding flowers? Our standard FREE shipping arrives in 7 days, as long as there are no holidays or crazy weather:) However, if you need them sooner, the shopping cart allows you to select 2-3 day shipping for additional cost. 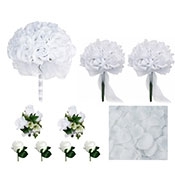 Are these wedding flowers real? 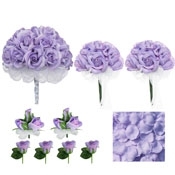 We are asked this question often because these wedding flowers are so realistic. 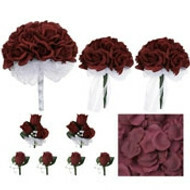 The goal in designing your bouquets is to make them look as close to the real flower as possible. Your family and guests to be surprised when you tell them your wedding flowers are silk. 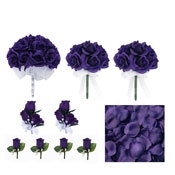 In fact, if you read our customer reviews below, many brides tell us how their guests thought the flowers were real! Currently we don't have a print catalog. However, every item we offer is available here on our website and can be enlarged to full screen so you can see every detail. If you like our pictures you will love our wedding bouquets in person. 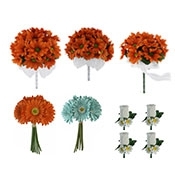 What if I receive my wedding flowers and I don't like them? We offer a 10 day unconditional money back guarantee. 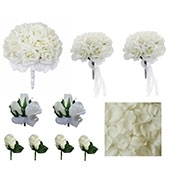 If you don't like your wedding flowers for any reason you can return them within 10 days from their arrival and we will issue a full refund minus any shipping charges. For more details click here. Regular ground shipping is FREE for all US mainland orders. International and Expedited shipping is additional. 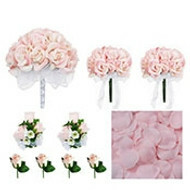 How are the wedding flowers packaged? Your order is placed into a sturdy cardboard shipping box and professionally packed to ensure they don't move, crush, or smash during transit. I live outside of the United States do you ship internationally? Yes we ship to most countries. 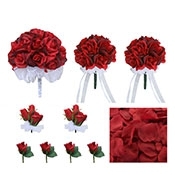 Simply select "International Shipping" from the shopping cart and it will show you the exact cost of the shipping as well as an estimated date of arrival for your wedding flowers. 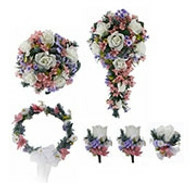 Rest assured that all of your wedding bouquets arrive to you just as pictured and ready to go. The pins are even included for the boutonnieres and corsages. I want to know if I can have something custom made? 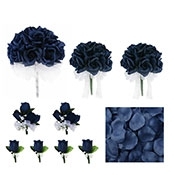 In order to keep our prices low and our shipping quick we offer a wide variety of colors and styles that are ready to ship. Although we don't offer custom services you can personalize your bridal bouquets and corsages with your choice of ribbon color, bouquet jewels, handle cuffs, and other embellishments. What is the difference between the ivory wedding bouquets and the snow white wedding bouquets? 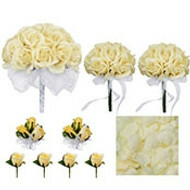 The ivory wedding bouquets are a soft ivory color which brings to mind the soft color of candlelight. The ivory wedding bouquets are the most popular among our brides. The snow white wedding bouquets are pure white like snow. Privacy is a top priority at TheBridesBouquet.com your personal information is completely safe here. Our checkout page is secure and encrypted. We don't sell, rent or share any customer data with any other agency.